Tristan Langan has been playing really great hockey lately; but never has he looked as great as he did on Thursday the 11th, at Mosaic Place, against the Calgary Hitmen. I mean, the kid scored a Hat-Trick in the first period. I think it's safe to say that he likes playing on a line with Jayden Halbgewachs and Tanner Jeannot. The three of them did enough in the first period to obliterate any hope Calgary had of winning. But that didn't cause them to slow down. Not one bit. At 5:03 in the 2nd period, the league leader in points, Brayden Burke, set Justin Almeida up for a short-handed goal, to go up 4-1, which really deflated the Hitmen's hunger for victory. By the end of the 2nd, it was 6-2 and Langan had scored his fourth marker of the game. Tyler Smithies and Tate Popple each added another goal in the third; and Moose Jaw took an easy 8-3 victory. Back-up Goaltender, Adam Evanoff let in three goals on only 20 shots and, as was expected, Tristan Langan was awarded the first star of the game. Both Halbgewachs and Jeannot had 3 assists, while Smithies and Dmitri Zaitsev had two points each. Calgary's Jakob Stukel had a pair of goals. 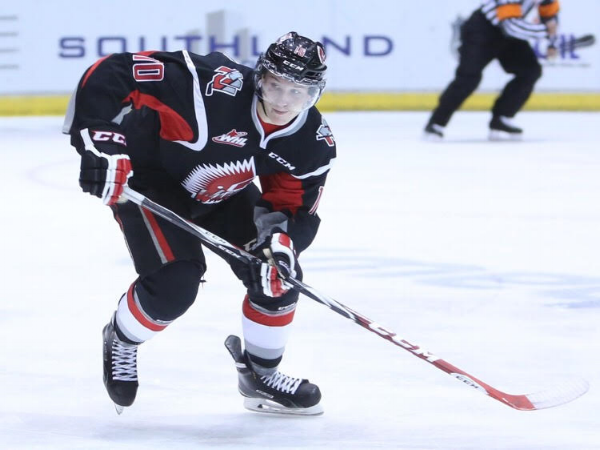 In other exciting Warrior news, they signed the best damn defenceman in the WHL. In a last minute deal at the trade deadline, they sent Luka Burzan, Chase Hartje and a slew of draft picks to Brandon for their Team Canada gold medallist, Kale Clague. Those lonely nights where goalies only face 20 shots are about to get a lot more common. Tanner Jeannot had 3 assists in the 8-3 win.